Because Margaret’s daughter was married yesterday, today’s digilit linkup is over at Julieanne Harmatz’s blog “To Read To Write To Be” here. Check out the other links. Trust me, Conferring Carl is so right. Conferring is the whole cake, the whole enchilada, the whole meal because it’s already the combination of many great ingredients in a flavorful mixture designed to entice the consumer! One goal of conferring is to move the writer to effective and more deliberate practices across multiple pieces of writing. The goal is NOT to just make this piece of writing better by fixing it. It’s about going for “big ticket items” that will help all future writing be better. There’s a part of conferring that requires the teacher and the student to have clear targets and end goals about writing. Hattie, Fisher and Fry say it best with this finding from John Hattie (millions of kids in the data pool) about teacher clarity in their book Visible Learning for Literacy. So what do clear teach goals look like? What are the possiblities? Here is an example of one way a class is looking at “leads” for organization in narratives based on checklists (Calkins and colleagues, Units of Study in Writing). If a student identifies that “leads” are the area of “trouble” that he/she wants to work on in a conference, a checklist like this may have been used. The student would not just be saying, “This story is not good or this lead is not good.” Instead the student would be saying, “I need to work on leads because my readers have commented on the last two stories that it’s hard for them to get right into the story.” This student may have self-identified that most of his/her leads were only a “one-star” lead according to a chart like this. The goal might be four star leads. what might later become a problem for the reader. Do you see langauge that might lead to a teaching point? Teachers don’t need a “new and different” list of resources to confer from. They are working with the lessons that have been taught and/or looking for those next step items that will strengthen student writing across the rest of the year. Leads are important in narratives, informational writing, and opinions/arguments. Is this the only concern in a narrative lead for fourth graders? Of course not. But this use of checklists in goal setting (Calkins and colleagues, Units of Study in Writing) helps students (and teachers) who are not yet expert writers with some common language that can be used for teaching points within a conference to improve all future pieces of writing. The student made some choices about his/her own writing and made a conscious decision about what to work on. That’s a win/win. 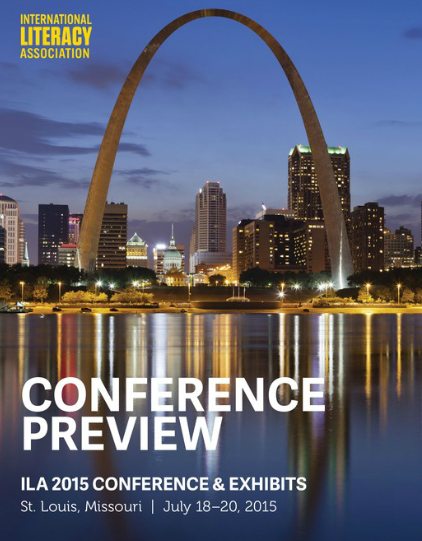 “This is by far the best writing on the conference I have read. It is a book that is far superior to the other texts-including my own. But the work ultimately needs to be done by students and involving them in this process and honoring their own goals/wishes/needs is critical. A conference like this with a writer allows the student to continue writing and may well set them up to be able to show peers and parents exactly how personal work with leads has improved his/her own writing. This student may well be able to teach other students exactly how and why to do this with their own writing. More writers who know why and how . . . that’s a reason to invest time in writing conferences. Don’t worry about perfect conferences! CONFER! What’s your next “Conferring” step? Twitter connections are so fabulous. 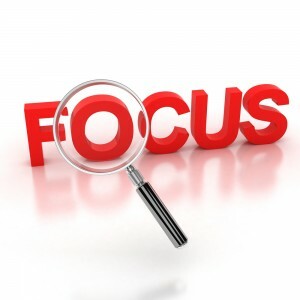 Via Twitter today I found out that the focus of #Digilit Sunday was function. Check out Margaret’s post here. The part of “function” that I have been thinking about a lot lately is “executive function”. It’s close to the end of this school year, but how can students still be increasing their own level of executive function? Isn’t this where deep learning and even transfer live? Isn’t this the whole point of moving beyond “surface learning”? And of course, the most important factor in executive function, in my opinion, is that a student has had plenty of opportunities to “do the work”? How do teachers ensure that students are doing the organizing and the self-talk? They must “say less so readers can do more” and demonstate over and over that they really can do the work with panache and confidence! For me, the connections from this post all began years ago during TCRWP Writing Institute with a conversation between Allison Jackson and myself about this book. That conversation grew into a book study, Twitter chats and actually meeting the authors. Completely life-changing . . . The function of learning is that students do the hard work of making meaning. That students actually dig into surface, deep and transfer learning. That teachers are like the conductors on the train. Recognizing the signs, making them visually and verbally apparent, but that ultimately students are really the ones who need to be in charge of their learning. And that learning should always, always, always be JOYFUL! But I can learn in spite of or even despite my education! Is learning the FUNCTION of your work? Posted in: #OneLittleWord, Uncategorized	| Tagged: Allison Jackson, Burkins and Yaris, Dorothy Barnhouse, Doug Fisher, John Hattie, Nancy Frey, TCRWP, Vicki Vinton, Visible Learning for Literacy, What Readers Really Do, Who's Doing the Work? Last week I was working with a group of pre-service teachers like I do every semester. I lingered on the writing examples, techniques and goals in the genres, mentor texts, and specifically generative writing. As I presented to this group, I literally wondered “aloud” why I had never written about generative writing. I believe that the power of generative writing lies in its ability to replace tired, ineffective DOL practice with meaningful, relevant writing that can also be used as formative assessment tasks. So what did the pre-service teachers do? They wrote a sentence where “writing” was the first word in a sentence with at least 10 words. And then they wrote a sentence where “writing” was the last word in a sentence with at least 10 words. Finally they wrote a sentence with “writing” as the fourth word in a sentence where they could choose the length (but it had to have a minimum of five words so “writing” was not the last word). Which sentence was the hardest to write? What strategies did you use to help complete the task? The majority said that the sentence with “writing at the end” posed the most challenge because it was the complete opposite of the first sentence. Some said that the first two were basically easy because it was about “flipping” the words in the sentences and that the third use of “writing” as the fourth word was harder because “you had to think about what could go before it”. Strategies that they used were counting words on their fingers, oral rehearsal, drafting and scratching out, drafting and then counting, and checking with a partner. This was meant to be an introduction, that in a classroom would include oral practice, study of mentor texts, and examples of vocabulary words used in various positions in real published work. Generative Writing is a term used to describe instructional strategies that provide students with parameters for their writing. 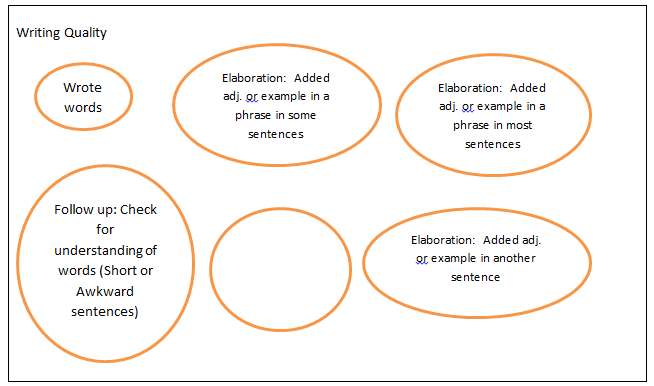 These factors define boundaries for writing at the sentence level. The model described above comes from Doug Fisher and Nancy Frey’s Scaffolded Writing Instruction: Teaching with a Gradual-Release Framework. What are the effects of generative writing? I think that sentence fluency, word choice and writing in a variety of genres are already covered in many writing workshops at a variety of grades. However, I believe that using generative writing in content areas to deepen understanding of content, vocabulary and even as a tool for learning and assessment are previously untapped areas of formative assessment that could be guiding higher-quality targeted core instruction for ALL students. 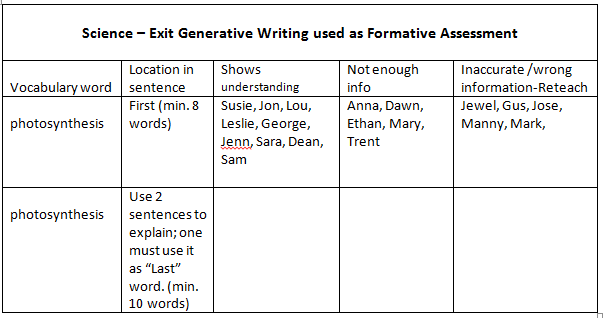 So how would I use generative writing as a Formative Assessment? I would use this with departmentalized content-area teachers who have all of their own content standards as well as a responsibility for reading and writing ELA standards. Asking a science class to use “photosynthesis” as the first word in a sentence will probably result in a definition. Here is an example of how the work may be sorted as well as the plan for using a second generative writing after some re-teaching. How did I plan for the generative writing at the top of the page? I am a firm believer that I must “practice what I preach” and complete writing tasks in order to increase my own understanding of writing. So of course I actually wrote some sentences. Here are some examples of sentences that I generated during the planning phase for my work. Writing is one of my favorite ways to express ideas because my artistic and musical talents are limited. There are some days that I feel like the most important part of the day is when I have time for writing. Some may argue writing is just one of many skills that students need to develop, but I would suggest that totally divorcing reading and writing is an exercise in futility. “Show don’t tell” and “Teach the writer not the writing” are my two most favorite Lucy Calkins’s quotes about writing. What are your favorite quotes that you use to encourage writing? Use “writing” as first word in a sentence with at least 10 words. Use writing as the last word in a sentence with at least 10 words. Use writing as the fourth word in a sentence as well as somewhere else in a compound/complex sentence. Use writing as the last word in a sentence using quoted text. Use writing as the last word in a question. Develop a cohesive paragraph during this generative writing exercise. I believe I met all 6 of my tasks; what do you think? How might you use generative writing? What an historic event yesterday! #EdCampIowa was held at five locations across Iowa. A phenomenal bunch of educators gave up their Saturday freedom to participate in a day of collaborative learning. I was fortunate to attend the “Central” location organized by @JamieFath and held at #SEPolk which is 1.5 hours from my home. Many came from the Des Moines metro area, but others came to our location from Illinois, Nebraska, Oklahoma, and Colorado. The call for sessions filled pretty quickly, newbies were encouraged to tweet and make new friends and the talk quickly centered around student learning. The sessions often were posed around a question or two: What about those students who struggle? How do we know students are learning? Is it about reporting the learning (based on the standards) or is it about the grades? And in the ensuing conversations, I loved the fact that MANY people from a variety of districts were discussing instruction in terms of the “Gradual Release of Responsibility.” Google docs allowed group participation in note-taking with many listed/ linked articles and resources. Were deep, thoughtful answers a result with 20-25 people in a room and a spirit of “conversation” not presentation? How can we create success for ALL students? What do I wish there had been time to share, demonstrate, and practice? Writing is often the “end product” for our youngest learners after much talking with a partner. What has to happen FIRST before students can or should be asked to write? I love to see students tell a story across their fingers, a la Lucy Calkins. No graphic organizer needed. What happens in the story at the beginning (touch index finger), the middle (touch 2nd finger) and the end (touch ring finger)? The student can orally rehearse the story as he/she literally tells the story by individually touching a finger for that all-important sequence development. I would also consider the use of communication lines with students. Again these tie in nicely with Gradual Release and Quality Instruction as well in the productive group work phase. It’s also a chance for the students to get up, move, and refocus. Have you used them? Typically a class is divided in half with two lines of students facing each other with about six-10 inches between the faces (Students 1 and 13 from chart below). 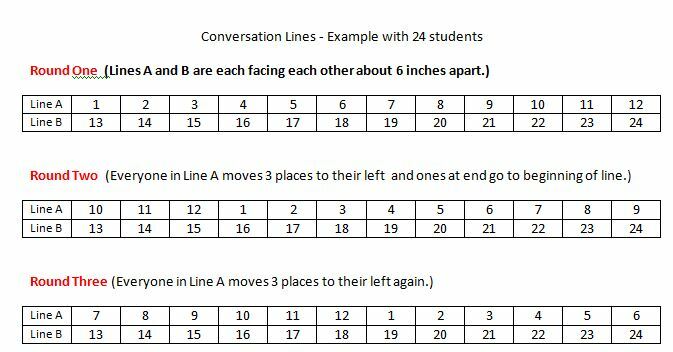 Students in the same line are at arm’s length between each other so they can clearly hear their own two-part conversations (Students 1-12). The first chart below shows what those two lines might look like as the two “partners from Line A and B face each other” and take turns telling their story. Then for round two, the students in Line A move three spaces (persons) to the left while students in Line B stay exactly where they began. Each partner group of two students facing each other again take turns sharing their own story with the new partner. Round three is the same process with students in Line A moving three more spaces (persons) to the left and the students in Line B still do not move. With 24 students it is possible to do a fourth round depending on whether the students need the extra oral practice. How do the conversation lines help? 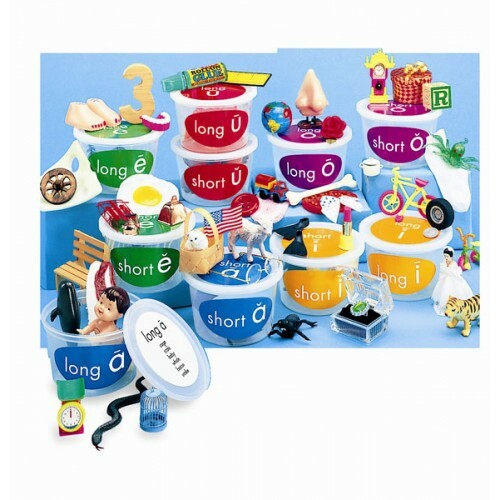 Students with IEP’s, struggling students, ELL students, or even students who have not done a lot of writing need large quantities of oral practice telling stories before they can begin to write those stories. It is not helpful for a student to sit and stare at a blank piece of paper. A story will not magically appear in the brain of a child. Quick, simple strategies to increase talk/ conversation are critical in order to maximize the amount of time available for writing! What about older students in middle school or high school? 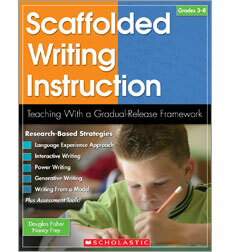 Many students struggle with using a “graphic organizer” for planning writing. They believe that the organizer is the task and then do not engage in the actual drafting. They also worry more about filling in the boxes/shapes than they do about the content of their responses. Other students don’t know if they have anything “worthy of writing” or whether it is “what the teacher wants.” All of these students would/could benefit from oral rehearsal before beginning to draft a piece of writing. How do you help students plan to “draft” their writing? How do increase the “talk” before writing so students have practiced their thinking? If you were at #EdCampIowa, how will you use your learning? Special thanks to the hosts of the Slice of Life Challenge: Stacey, Tara, Dana, Betsy, Anna, and Beth. More Slice of Life posts can be found at Two Writing Teachers .